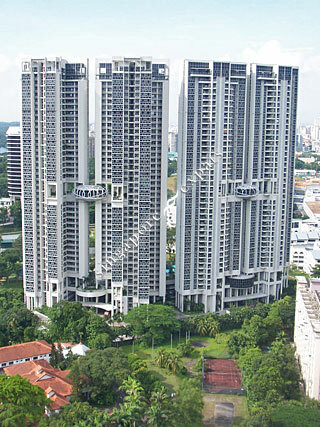 Sky @ Eleven is a four-tower 273-unit condominium located along Thomson Road, soaring 43-storeys into the sky. Sky @ Eleven is overlooking the lush greenery of MacRitchie Reservoir to the north and the magnificent skyline of the city to the south. Each and every apartment at Sky @ Eleven offers dual views and frontage with superb cross ventilation for natural breeze and bright illumination. The interiors in Sky @ Eleven are fitted with quality finishing and accessories from established brands; stunning dry and wet kitchens complete with the top designer appliances. Sky @ Eleven is an oasis of privileged living where nature and luxury are in total harmony. 50m lap pool, a leisure pool with Jacuzzi, a children's pool and a playground are located on the garden deck whereas outdoor facilities such as the tennis court, jogging trail and fitness stations are housed at the arrival deck. Sky @ Eleven is within close proximity to the Central Business District (CBD), Orchard Road, Novena Square, United Square and the Singapore Polo Club. Sky @ Eleven is just a few minutes stroll from the Novena MRT Station and a short drive away from popular Newton Circus with many top schools such as SJI International, CHIJ and Raffles Institution in its immediate vicinity. Sky @ Eleven is accessible via the nearby Pan Island Expressway (PIE) and Central Expressway (CTE) which leads to all parts of Singapore. With the beautiful MacRitchie Reservoir and the exclusive Singapore Island Country Club within easy reach, Sky @ Eleven offers you the perfect blend of urban convenience, peaceful tranquillity and privileged living. Central location , close to amenities. All units comes with panoramic views of Mac ritchie resevoir and novena/ orchard city skylines. Excellent Location. MIns to Novena and Orchard. Central location. Easy access to PIE . Units are bright and breeze.